In Charlotte Perkins Gilman’s short story “If I Were A Man,” a woman inhabits her husband’s body for an afternoon and uses her position to tell other men that women are just as smart, athletically talented, and employable as they are and as such, should not be judged for things like caring about fancy clothing or marrying the right person, because men have made it so that they have to do those things. Gilman, the author of oft-assigned short story “The Yellow Wallpaper” (1892), wrote frequently about women trapped by a patriarchal society. The heroines of her stories are emancipated by finding jobs, launching successful businesses, paying off their mortgages, falling in love with men who are interested in them rather than their domestic skills, and being rescued by cleverer women from the monotony of housewifery. Her writing can be heavy-handed, but her message is clear: women should be valued for who they are as people, rather than for their roles as wives, mothers, and caretakers. (Though if a woman is a natural caretaker and likes being that way, then it’s fine as long as she can make money off it, as one of her characters does when she starts a babysitting service.) Reading Charlotte Perkins Gilman now, over 100 years since she started publishing, I saw how little has changed in our society’s attitude toward women. I also recognized just how much has changed in that, as a woman (of a certain class and race) in the 21st century, I am able to work without question, to live on my own, to be as interested or disinterested in the domestic as I want to be. As a friend recently commented, it’s unlikely that we would be where we are now if women like Gilman hadn’t gotten angry and started writing or protesting. But it makes me sad when I think about how many women I know, myself included, feel far less entitled than their male counterparts, often without even realizing it. 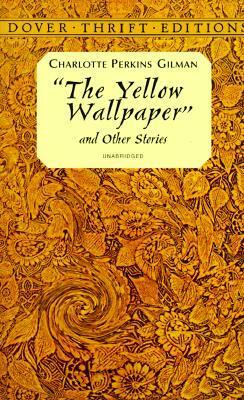 Of the eight or so stories I read in the last week, I found “The Yellow Wallpaper” to be the standout. This isn’t surprising, as it’s Gilman’s most famous story. But what stuck with me was not the prose or her ability to create tension, but the fact that the story is not at all optimistic. The narrator, a woman who has been prescribed a rest cure while suffering from what we now know as postpartum depression, descends into a psychotic state as she imagines that the wallpaper in the room where she spends most of her time is moving. At the end of the story, she is not saved, neither by herself nor anyone else. She is mentally ill and beholden to her husband, who dismissed all of her prior warnings that she was not getting better. Where Gilman’s other stories seem like fantasies about women finding ways to have full lives outside of home and family, “The Yellow Wallpaper” is – in an extreme way – honest about how most women were dismissed by men and suffered as a result. In fact, Gilman herself famously had postpartum psychosis. “The Yellow Wallpaper” was born of that experience. What have I been reading otherwise? I liked this TNY piece on Chloe Sevigny at 40. She is, unsurprisingly, an all-time favorite of mine. (I was ecstatic to see her in the new Netflix series Bloodline, even though I thought her character was a little blah.) I also couldn’t help but read all about Lilly Pulitzer for Target. From the angry screeds on my Facebook timeline to coverage of disappointed Lilly fans to actual reviews of the Target line and the Lilly aesthetic itself, I reveled in the criticism of this brand that loomed large during my childhood and adolescence and that I myself have come to have a distaste for*. I found this Jezebel critique – ‘Wealth Accompanied by Rejection of Creativity’: Bye, Lilly Pulitzer – especially delicious. However, I’m still fascinated by – and not in a mocking way! in a very real way! – the whole Palm Beach-y, ladies of leisure lifestyle that Lilly is associated with. And for that reason, I also decided to revisit this 2003 Vanity Fair interview with Lilly Pulitzer herself. On a not unrelated note, here is a Town & Country piece on Dorrian’s Red Hand, the ultimate Upper East Side preppy bar. I’ve only been there maybe three times and have run into people from past lives on each of those trips, so their first point is at least definitely true. I’ve also been working my way through the current issue of The Paris Review, by which I mean the interviews with Hilary Mantel, Lydia Davis, and Elena Ferrante. (What a boon to be able to read these three in the same issue!) I’m still “reading” Stoner and I think I might just give up soon? I’m going away for the weekend and I didn’t even bring it with me. Instead, I have Kate Bolick’s Spinster in my bag.